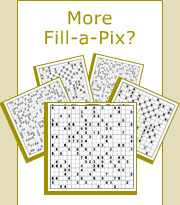 Fill-a-Pix are exciting logic puzzles that form whimsical pixel-art pictures when solved. Invented by Trevor Truran and developed by Conceptis, these puzzles offer the ultimate mix of logic, art and fun while providing solvers with many hours of mentally stimulating entertainment. Fill-a-Pix is a Minesweeper-like puzzle based on a grid with a pixel-art picture hidden inside. Using logic alone, the solver determines which squares are painted and which should remain empty until the hidden picture is completely exposed. If you like Pic-a-Pix, Sudoku and other logic puzzles, you will love Conceptis Fill-a-Pix as well!